The Thunderbots, who are getting ready to helm their STEM Bonanza workshop for fourth- through eighth-graders Saturday in the Engineering Building, competed in a VEX Robotics regional competition earlier this month at Embry-Riddle Aeronautical University. 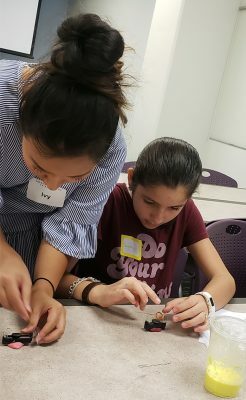 GCU’s Robotics Club conducted a Girl Powered STEM event in 2018, in which participants built battery motors. This Saturday’s workshop, open to boys and girls, is dubbed the STEM Bonanza. 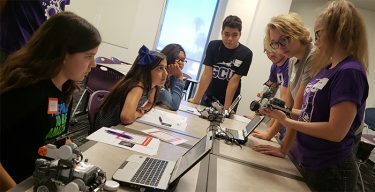 The Grand Canyon University Robotics Club, the Thunderbots, will go all science-y on Saturday, hoping to share its love for science, technology, engineering and math to the next generation of scientists, mathematicians, engineers and the like. The club, in collaboration with the University’s K12 Educational Development, will launch the Thunderbots STEM Bonanza for fourth- through eighth-graders from 8:30 a.m. to noon in Rooms 202 and 204 of the Engineering Building. It won’t be the only big STEM-inclusive event unfolding on campus that day — hundreds of GCU’s students will present their research, business proposals and work-inspired projects at the College of Science, Engineering and Technology Symposium and Honors College Showcase. “We’re going to go through the four letters of STEM,” Robotics Club President Makayla Jewell said of the workshop. For the “S” in STEM, participants will make bouncy balls and a water-cornstarch oobleck mixture. For the uninitiated, oobleck – named after a gooey green substance that falls from the sky in the Dr. Seuss book “Bartholomew and the Oobleck” – is kind of like slime but possibly cooler. As a non-Newtonian fluid, oobleck is somehow both a liquid and a solid. It acts like a liquid when being poured but takes on the qualities of a solid when a force is acting on it. Applying pressure on the oobleck will increase its viscosity by smooshing together the cornstarch particles, so much so that an oobleck-maker might be able to form the odd substance into a bouncy ball. The GCU Robotics Club dubbed their competition robots Lilo (right) and Stitch (left). For the “T” in STEM, Jewell said participants will program Lego Mindstorms robots. The engineering portion of the workshop — the “E” in STEM — will involve putting together simple electric motors using a battery, wire, paper clips, modeling clay and a small magnet. The activity will show how electrical energy can be converted into mechanical energy via an electric motor, such as a battery motor, which works by way of the interaction between a current and magnetic field. Then for the “M” part of the workshop – or “math” – participants will decode codes with wheel cyphers. It was Thomas Jefferson who invented the wheel cypher as a way to encode and decode messages during his time as the United States’ minister to France (when highly sensitive government mail was in danger of being opened along the way to its recipient). His wheel cypher is made up of 26 cylindrical wooden pieces threaded onto an iron spindle. Saturday’s STEM Bonanza isn’t the first workshop the Thunderbots have helmed for young students. In 2018, the group organized a Girl-Powered STEM workshop. This time, Jewell said the club wanted to open up the STEM opportunities to everyone, boys and girls. 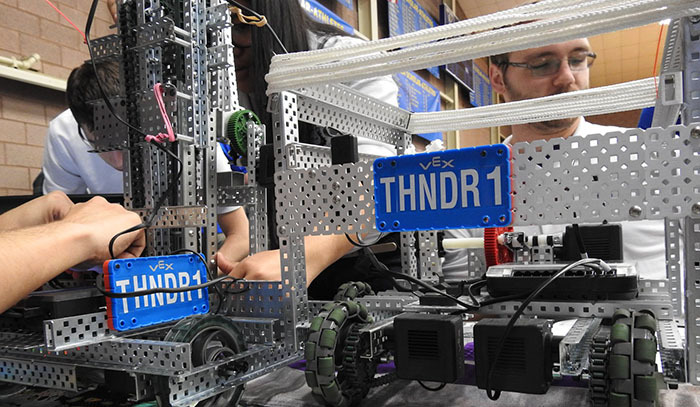 In 2018, the Thunderbots were one of 90 collegiate-level teams to compete in the VEX Robotics World Championship at the Kentucky Exposition Center in Louisville (though approximately 1,100 teams showed up to battle, counting middle and high school clubs). The team was ecstatic to bring home the Judges’ Award, which goes to the club that shows exemplary effort and perseverance, team accomplishments or endeavors that are deserving of special recognition. It’s part of the club’s mission to be mentors to future STEMists, such as at the Girl Powered STEM workshop in 2018. The team’s faculty advisor, electrical engineering technology instructor Ed Koeneman, said the Thunderbots had to overcome multiple challenges this year. 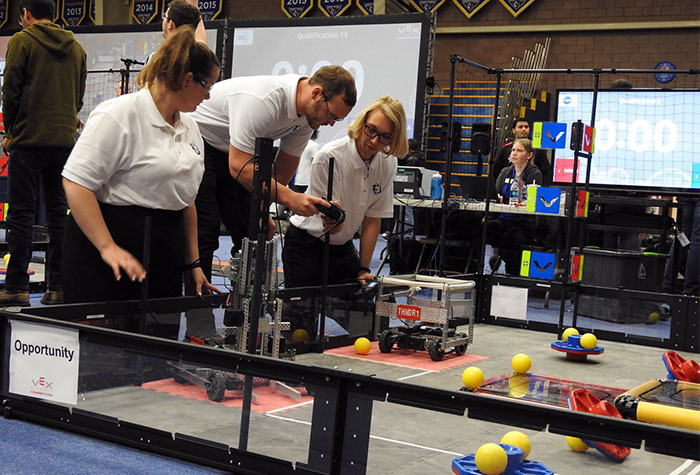 When VEX Robotics announced its new game for 2018-19, Turning Point, it meant a lot of changes for the team, including buying a new hardware system – a new robot brain, motors and sensors — and building not just one but two robots mandated for the game. “That put some financial challenges in front of us,” said Koeneman, who added that the team was thankful for appropriations it received from the Associated Students of Grand Canyon University. The team also was set back by an eight-week backlog of orders for parts to meet the new robot mandates. 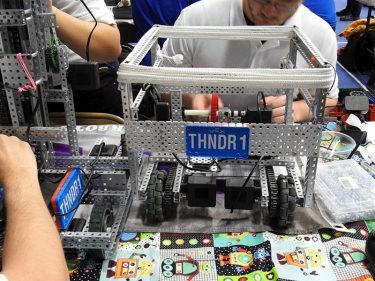 The Thunderbots overcame many challenges during competition season this year. “We built as much as we could using the old brain,” Koeneman said. Once the parts came in, “Makayla and the rest of the team pulled three all-nighters” to ready their two robots, a square-ish robot dubbed Lilo and a taller robot called Stitch. Then they had to learn a new system. Despite the brief learning window, team member Ed Haas was able to program the system in time for the Southwest VEX U Regional Qualifying Tournament at Embry-Riddle Aeronautical University in Prescott earlier this month. 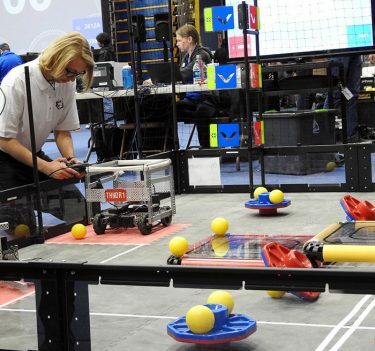 “We competed well,” Koenman said, but the Thunderbots’ season ended in the quarterfinals. The team lost its final bout by just three points to the team that went on to win the competition. One of the Thunderbots on the field of competition. Despite all those challenges, the club is looking forward to next season and the new game that VEX will announce in the next few months. “We’ll have a full season with all of the hardware,” Koeneman said. 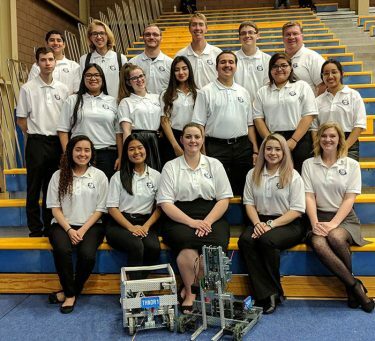 Meanwhile, the team is moving forward as it gets ready to volunteer at the Arizona West Regional FIRST Robotics Competition on April 5-6 on the GCU campus, an event that attracts hundreds of high school students annually. There’s also the STEM Bonanza, which will help the Thunderbots fulfill part of their mission, which is to reach out to young STEMists. The bonanza also will serve as a fundraiser for the team (it’s $20 per student to sign up). “Fun will be had by all,” Koeneman said.